Color and light are the elements that inspire me to paint. I relate to them on an emotional level. Jean (Thompson) Schwartz, a native of New Jersey is an oil painter who is equally at home working en plein air or in her home studio. Her subjects are varied and include landscape, marine, and cityscapes. Jean majored in Fine Arts at Upsala College and between her junior and senior years earned a certificate from LEcole du Louvre in Paris for studies in art history. After graduating from Upsala she spent a year working and studying in Paris where she enjoyed having her first exhibit of paintings at the Galerie du Passeur on the rue du Bac. Returning home she exhibited her work in galleries and regional exhibits in New York state before moving to Washington DC which became her permanent home. There her work caught the attention of a gallery on Capitol Hill (Talking of Michelangelo) which exhibited the work of DC women artists exclusively. The gallery was active in promoting women artists throughout the 70s. In the mid 80s Jean attended George Washington University where she graduated from the Landscape Design Program and started her own landscape design business. That work furthered her love of landscape painting and after 12 years she closed her business and returned to painting full time. Jeans paintings are in private and corporate collections both in the U.S. and France. Through the State Departments Art in Embassies program she has loaned paintings to the US embassies in Ankara Turkey and Soltje Macedonia. 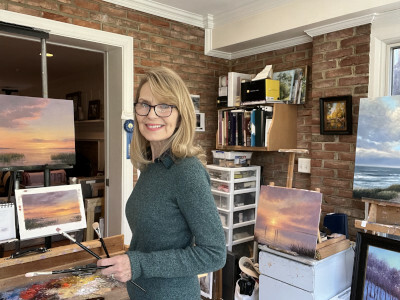 She is a juried member of the Washington Society of Landscape Painters, The Salmagundi Club NYC, The American Artists Professional League and Oil Painters of America.